The 14th Dalai Lama-Tenzin Gyatso (DL) has expressed strong support for the Universal Declaration of Human Rights (UDHR). While this may seem to be consistent with his outspoken promotion of basic "human values" and "universal responsibility" (Piburn, 2002), there is an unresolved metaphysical conflict between his endorsement of the UDHR and concomitant ideas like "inherent dignity" and "inalienable rights," on the one hand, and, on the other, his espousal of the Buddhist "Middle Way" or "Centrist" (Madhyamaka) thesis that all phenomena (i.e., persons, things, and ideas like "human rights") lack "intrinsic existence" (svabhāva). 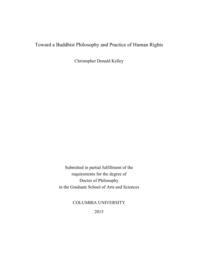 In this dissertation I argue that an "unforced consensus" (Taylor 2011) on rights can be achieved through an application of the Madhyamaka interpretation of the "two truths" (dvasatya; bden pa gnyis). Metaphysics, however, is only one dimension of the Madhyamaka account of reality. There is an equally (if not more) important "cognitive dimension" that pertains to how one sees and interacts with the world (Westerhoff, 2009). I believe this can be effectively applied to an analysis of the psychology of human rights foundationalism (i.e., the mindset that reifies rights). The DL believes that ultimately the safeguarding of human rights culture depends on a cognitive shift at the individual level. I explore the philosophical implications of this belief, and I contend that it is consistent with the concept of human development and education in the UDHR. I conclude that Tibetan Buddhist ideas and practices can potentially help bridge the divide between human rights foundationalism and anti-foundationalism in a manner that reinvigorates the utility of the UDHR, and yet does not philosophically yield to an essentialist world-view.